an architecture: Stolpersteine - Controversial Remembrance. During National Socialism 65.000 Jewish citizens from Austria were murdered. Austrians played an active role in prosecution, expulsion and extermination of their Jewish fellow citizens. Immediately after the so called “Anschluss” in March 1938 the national socialist and anti-Semitic population, in particular from Vienna, humiliated Jewish citizens by forcing them to clean the streets on their knees from pro-Austrian writings. 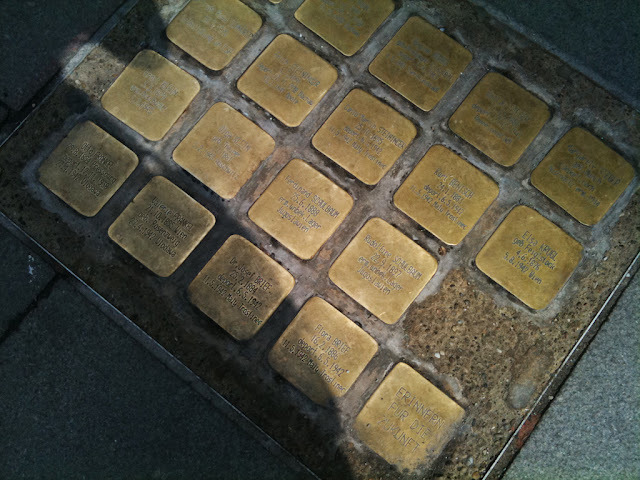 The "Stolpersteine" (Stumbling blocks), a project originally created by the German artist Gunter Demnig, should commemorate Jewish citizens deported and killed in Nazi concentration and extermination camps. Paving stones made of brass show their names, dates and location of birth and assassination in front of their last domicile. Somehow the project made a virtue out of necessity: many landlords don’t allow commemorative plaques to be fixed on their facades. But is the messy city pavement an adequate place for remembrance? The project is controversial. For many it is unbearable that again people tramp on Jews. In that reason, Munich removed already installed "Stoplersteine". In Vienna such a discussion has not begun yet.